Wilson First Graders Show "Forgiveness"
Wilson students are learning about the character trait of forgiveness during the month of January. We've learned that forgiveness means to stop being angry about something; to forgive somebody for a mistake. 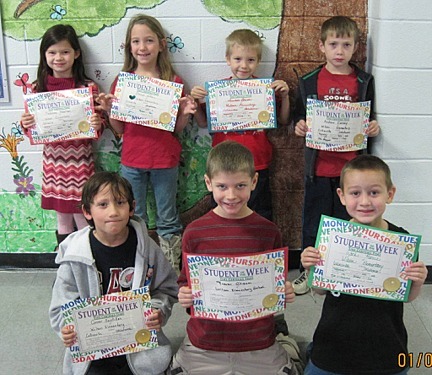 The 1st graders recognized a student in their classes who shows the character trait of forgiveness on January 7. The Collinsville Patchworkers met January 11, 2011 at the Library and welcomed guest Teresa Pugh. Members shared their New Year's resolutions, as they pertained to the quilting world, and Janice Coke's program centered around the Snail Trail quilt pattern, and information about different adjustable tables for your sewing machine. Members enjoyed several door prizes, and discussed plans for the Saturday Sew-In. The next meeting will be February 8, 2011, and the dozen 5" squares for the drawing will be in red and/or have a Valentine's Day theme. L-R: guest Teresa Pugh displays one of her first quilts, as President Sherry Neph looks on. 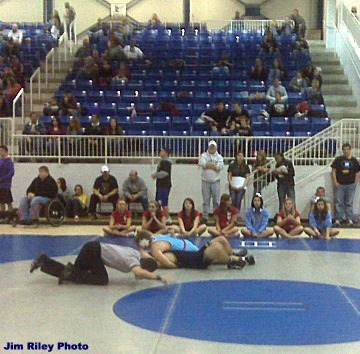 Grant Patton pinning his opponent in the Sapulpa wrestling tournament Friday.